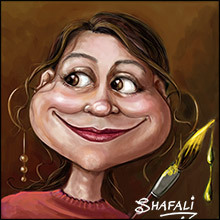 I am Azhar Youssef; an EFL female teacher from Egypt. I am …. What about visualizing me instead? Below, you can see a poster about myself. Kindly hover over the items to know more about me. Thanks so much for dropping by. I am so happy you liked the idea. I just try new things …. My students always ask me for crazy and new things! So, I have to be ready! Thanks so much, my dear friend for the compliments 🙂 I just wanna make a difference in my students’ lives …. You definitely deserve the compliments! 🙂 It sounds like you’re doing a wonderful job of making a difference, I’m sure they appreciate you and especially will once they’re older and reflect back! It sums up the whole story with my lovely students! Again and again thanks so much for your nice talk today! Oh how awesome! I’m going to go read it right now. 🙂 And thank You for the lovely talk! Your site is simply amazing. I have never seen a site that is so user-friendly. I am going to follow you as you are a teacher, and I am a willing student. What an inspiration. It will take me a while to view all that you have shared and accomplished. Your students are fortunate because you are passionate about your calling. I’m glad to have met you through the Thinglink Teacher Challenge! Thanks so much for dropping by. Your words made my day, indeed. Actually, I have very brilliant students that always impress me. I will follow you on google+ #TLChallenge to see your interactive images and learn from each other. Hello! I just stumbled upon your blog following a link from another blog and I must say your abpout pag is awesome. I tried making one like that with Canva and Thnglink but I can’t figure out how you put the social media buttons with links (on the left side), when I export image from canva as png, all the links on it disappear. If I download it as pdf I can’t add the links with thinglink. I figured out how to tag with thingling but it puts these icons on links. How did you do the twitter, facebook etc buttons with links? Did you use the paid solution or is there a trick? First, create an image using Canva. Once you finish, kindly export it as png. Second, upload this image to ThingLink to tag it. Just click anywhere on the image, then a window pops up in which you can choose icons and link them. It is so easy! Third, copy the link of your interactive image. In your page, click “Add Media” – insert from URL – paste the link, click insert into page, and finally hit the publish button. That is it! 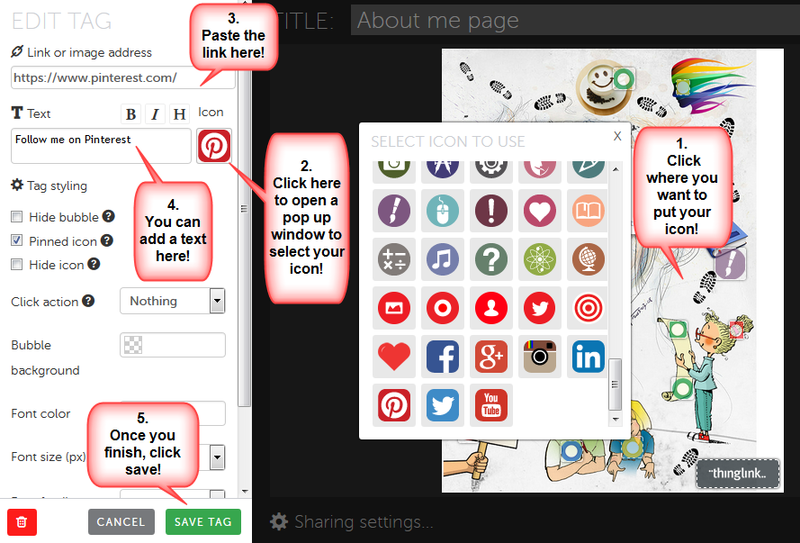 Here is a screenshot that can help you to tag your image using ThingLink. Please, click the image below to open it in a separate tab. I hope it would be helpful! Oh, I didn’t realize the ‘insert from URL’ thing thank you sooooo much! That should do the trick! You are welcome, dear Leona. Please, kindly share your About page once you finish to see how you did it. I love to learn from your creativity! I love your About page interactive image. It is so simple, creative piece with many info about you. Living in many places is a gift, I believe. You will be a multi-culture person with many perspectives of thinking. I followed you via twitter; my favorite social tool to learn with and from you. This is the best use of creativity that I have ever found on a blog “About” page. It really drew me in. Considering that you are a fellow life-long learner, I am looking forward to reading more posts in your site. Just recently, I started an online class and I am contemplating going back to school full time. I suspect that you may have some inspirational and challenging thoughts for me here. Thanks so much for the compliments. I am so happy to find a person who is interested in creating online environments for her students. Please, let me know what kinds of tools you are going to use. 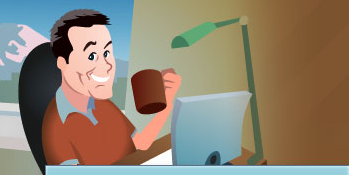 I used blogs, wikis, Facebook groups and more with my students and worked so well. To know more ideas, please visit my other educational blog “https://azharreflections.wordpress.com/” as this blog is under construction. I have just started it, but of course never stop. I went to your blog to see how you work, but unfortunately it says it is protected. 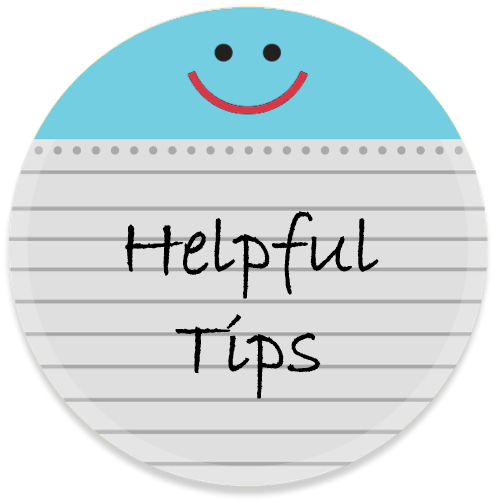 You can go to your dashboard – setting – reading – and check the first option “Allow search engines to index this site.” This will help me to view your posts and leave comments on. I am looking forward to learning with and from you dear friend. Followed you to read more creative posts. I am sure one can improve her writing skills when following people and reading their pieces. All the best! It is great to meet people with the same interests here. I am sure there’s a lot for us to learn from each other. Stay happy! Thankyou for the suggestion. But after going to Setting – Sharing – I don’t see the ‘show buttons on’ section. It’s great. I have never seen such amazing about page. I appreciate your skills. This is so unique and thank you for the links. When I am braver, I’ll try them out! I appreciate your coming here in my world. You are welcome, dear. When you get started your exploration, just let me know to learn together. Trying new things makes one feel different and creative. So, let’s do it! I will certainly do that, Azhar. 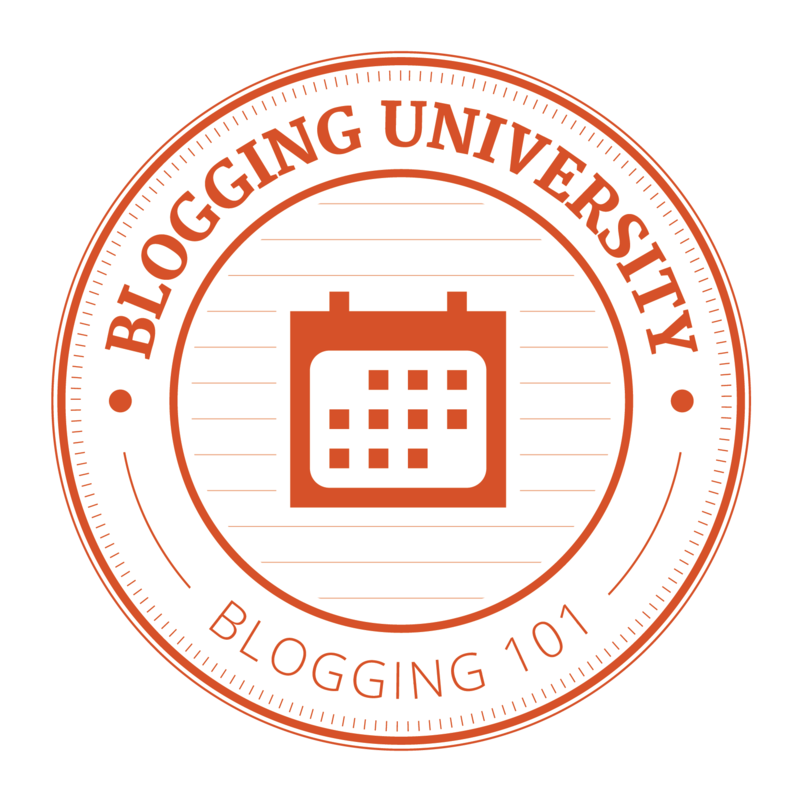 Now, on to today’s Blogging 101 assignment! I love your About Me page – so friendly, inspirational, interesting and looks amazing. Thanks @ruthlakes so much for your nice words. I spent the whole day working on this poster. That’s why your feedback means a lot to me. I’ve never seen anything like it before! It’s highly creative and arouses curiosity. I can learn a lot about you in just one page. Don’t you think you’re giving too much information in your about.me? To be honest, I feel like I don’t need to go to your posts to find out more. I have it all here. Thanks so much dear Rinda Sukma for passing by. I agree with you about the info I give here. I just wanted to collect all my areas of interests in one place not just for my readers, but for me too. Thanks so much for your note. I can modify it to make every tag a little bit short, so you don’t need to spend too much time reading and surfing. Thanks so much for visiting my About page. Your nice words mean a lot to me. Working with such creative people like you all inspires me and encourages me to do my best. This is different! I like it and I love new things. It makes you sound interesting. Thanks @jacquelineobyikocha for dropping by. I am so happy you liked it. You can give it a try using Canva and ThingLink! Just let me know when you need any help. Scaffolding each other is part of a very effective and deep learning. Your blog is so fabulous; the form and content. I followed you and will spend some time enjoy reading your poetic words. I am so happy to meet you online. Actually, this course gathers very great people. I am lucky to be part of this community. I am looking forward to learning from you! Thank you so much Azhar for your kind words. I am right at your back as well. I totally agree that we can all learn from each other.